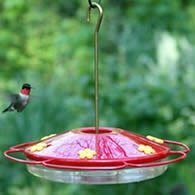 An understanding of the hummingbirds nesting, mating, and feeding habits may aid you in attracting and keeping these small wonders in your backyard garden and around your bird feeders. 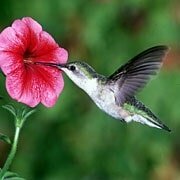 The Ruby-throated only measures 3 3/4 inches long, and is the widest-ranging of all North American hummingbirds. This green and scarlet little bird is the only one likely to be seen east of the Mississippi River and certainly the only to breed in the area. The male Ruby-throated has green upperparts and a iridescent red throat. Although depending on light, the throat may appear black. The breast and middle are whitish. Female Ruby-throats have green upperparts and whitish underparts. A feeder filled with sugar water will attract this relatively tame visitor. Just mix 1 part white sugar with 4 parts water. Boil the mixture 3 or 4 minutes and let cool. Fill your feeder and store any of the leftover nectar recipe in the refrigerator. 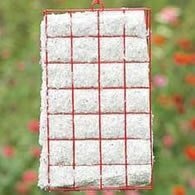 Your feeders need to be cleaned throughly every 3-4 days. These birds must eat all day long just to survive. In addition to nectar from flowers and your sugar water feeder, these birds eat small insects, beetles, ants, aphids, gnats, mosquitoes, and wasp. 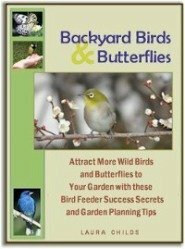 As you can see, it's to your advantage to attract these jewels to your backyard. Many ask the question "When do I need to take my feeder down?" 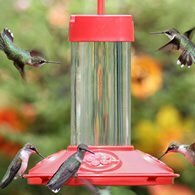 A common myth is that leaving your feeders out too long will cause the hummers to stay longer than they should. This just isn't true. 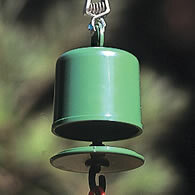 The recommended best time to stop feeding hummingbirds is two weeks after you no longer see them visiting your yard and feeders. As long as you still see them visiting keep providing for them. This will allow them to store fat resources for their long migration. If a freeze is predicted, bring your feeder indoors for the night and return it as early in the morning as possible. They need to refuel after a cold night. We're often ask "how do hummingbirds stay warm at night?" Well, along with the normal things birds do such as puffing out feathers for better insulation and finding sheltered locations to roost, these birds have the ability to reduce their temperature and slow their metabolisom down. This is referred to as "Torpor". Think of it as a mini hibernation just to get through a cold night. They are not the only birds capable of doing this but neither can all birds do this. We get emails from visiters who find these birds in a state of torpor and hanging upside down on the feeder. Othertimes, early in the morning, some people have picked them off the feeder thinking they were ill. It's is always best to wait and see. Let them come out of this state at their own pace so that no harm is done to the bird. When looking for Ruby-throats nest, you'll need a keen eye. Its nest is a cup of plant down and spider web, covered with flakes of lichen, placed 5-20 ft. above ground. Look for a horizontal limb with a slight downslope. Two white eggs are incubated for about 20 days by the female humming bird and the young will leave the nest 20-22 days after hatching. These birds don't reuse a nest from season to season but may reuse it in the same season for its second brood. They often return to the same territory from year to year and maybe to the same shrub or tree. Nest are very small and are easily destroyed by winter weather but remember, it's illegal to remove or take any nest that you may find. May attempt 2 broods each season. In spring, the male defends his territory of about 1/4 acre. In dive displays, he flies in a U shape, rising 10-40 ft. on each side. After mating, the female builds the nest and raises the young alone. Hummingbirds do not ride on the backs of geese during migration. They migrate on their own power. Generally, adults birds migrate first, while the young continue to feed and grow before migrating. Some Ruby-throats migrate 600 miles across the Gulf of Mexico. During fall they will store enough fat to double their weight in order to make the long trip. That's quite a feat for a bird that weighs about the same as 2 1/2 paper clips! Download Now & Attract More!